Nobody likes paperwork. But it's an essential part of doing business, nowhere more so than in the construction industry. But everyone likes mobile digital products, especially as they become both cheaper and easier to use with each new generation. So one didn't exactly have to be a rocket scientist to figure out that: A. paperwork has largely migrated to computers, and B. people of all ages are now routinely carrying around tiny computers in their pockets, so C. why not develop these office software programs to be compatible with mobile devices? There's no denying that the development of office based computer software programs more than a decade ago was revolutionary. These programs saved transcription time, compelled users to use approved formats, and could be stored much more easily than paper files. But these programs had their drawbacks, especially in industries that often lacked conventional offices, as in construction. Then cell phones came along, which rapidly evolved from a novelty to an essential communication and entertainment system. With everyone spending so much time on them, is it any wonder that they're being utilized as work tools? But the right software is essential. Take Raken for construction daily reporting, for example. With an application powered by Android and iOS, Raken takes users to industry approved fields that allows them to complete daily reports in ninety minutes or less. In addition, Raken's software allows users to protect firms in terms of litigation by easily recording and storing documentation. And not only does this software allow for the writing of standard reports, it allows users to chronicle safety and other issues in real time for other users to immediately see. In addition to emergency matters, Raken's app allows firm co-workers to "distance collaborate" and edit reports, even creating and sending PDF files, reducing the need for physical meetings and saving money. And while everyone from toddlers to grandparents are texting pros these days, Raken has a convenient alternate feature that allows speaking report and notice information into devices in addition to writing it. 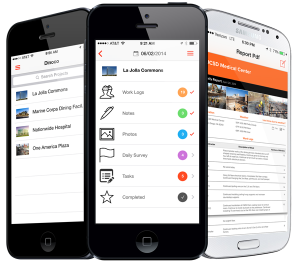 In addition to allowing multiple employees to access reports at the same time in real time, Raken’s mobile apps for construction industry allows authorized clients and stakeholders to do so as well. Since a picture is worth a thousand words, this software allows for the addition of additional files, photos, and even videos to reports. Raken even has a feature that allows these photos to be curated. And in case anyone forgets to check, Raken issues automatic notices and reminders to all authorized users. And Raken doesn't just provide access to current reports. An unlimited amount of files can be stored for up to ten years with cloud technology, and are easily accessed via keywords. And because firms increasingly have both employees and clients that are foreign-born, the Raken app allows reports and comments to be recorded and commented on in a variety of languages. All of this, and Raken's software still has room to support executive reports, weekly reports, monthly reports, and Excel programs for payroll purposes. So your firm can continue to struggle with hard copy spread sheets, and be left behind in terms of projects and profit, or it can join the digital revolution, stock up on cell phones, and see how construction software like Raken can transform both their firm’s paperwork, and the firm itself by using a daily construction log.